The last time neutral English Premier League (EPL) fans got really excited, it was at the prospect of an underachieving side winning the title. Back in the 2013-14 season, a Luis Suarez-inspired Liverpool kept the football world on tenterhooks by pushing a cash-rich Manchester City down to the wire in a pulsating title race. However, this term could well surpass that season's level of entertainment if things continue going the way they have. With the 38-game season just slightly past the halfway point, the likes of champions Chelsea are mired in mid-table mediocrity while minnows Leicester City are five points clear at the top of the table. There have been several upsets, such as Southampton thrashing title hopefuls Arsenal 4-0 as well as newly promoted Bournemouth stunning Chelsea at Stamford Bridge. All these surprising results mean that every team has beaten a team who have gone on to beat another team, with the end product being a full circle (see illustration). The unpredictability of this season is all the more surprising considering that only five clubs - Manchester United, Manchester City, Chelsea, Arsenal and Blackburn Rovers - have been crowned champions since the start of the Premier League era in 1992. These days, things appear to be quite different, with most neutrals willing Jamie Vardy and Co on, as Leicester City aim to create history by clinching their first English league title. Vardy himself will also be gunning for personal glory by finishing as the first English top scorer since Sunderland's Kevin Phillips notched 30 goals in the 1999-2000 season. He is currently leading the scoring chart with 18 goals, including the recent stunning volley against Liverpool on Feb 2. It has been a breathtaking season so far, with no shortage of twists and turns. 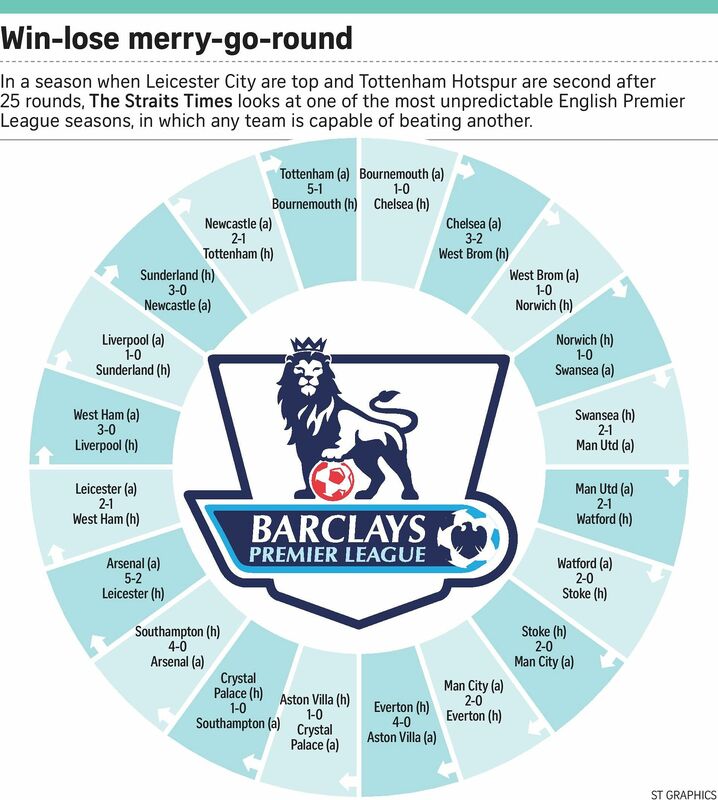 EPL fans should hang on tight for the rest of this thrilling roller-coaster ride.